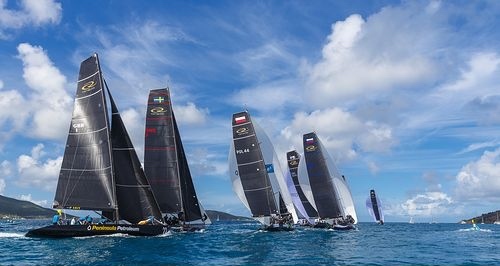 Despite the wind gods repeatedly throwing curve balls at competitors in the RC44 Virgin Gorda Cup, today Torbjörn Törnqvist and his Artemis Racing crew firmly consolidated their lead in this regatta. The Swedish team led going into the day and promptly won the opening two races, the first being a nail biter as they lost the lead, only regaining it on the finish line. 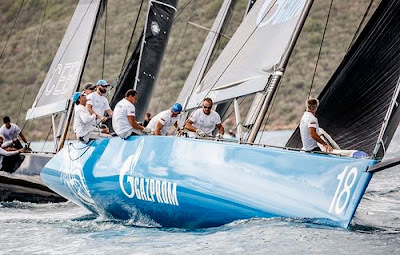 They followed this up with a 6-2, making them top scoring boat of the day, and eight points clear of Vladimir Liubomirov's Bronenosec Sailing Team in second overall. "It was a good day," said Törnqvist. "We got relatively good starts, we found the lanes and had speed upwind and downwind. We got the right side of the shifts and when you are in front it all becomes a little easier." 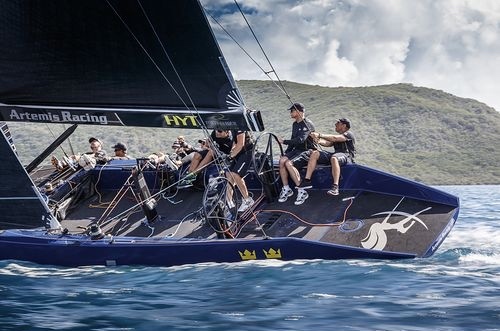 This season, Artemis Racing's top position has been a fourth in Marstrand, but the team is well on track to changing that here. "Even though the results haven't been what we had hoped for in the season, we feel we do have the speed and, when it comes together, it works well. Francesco [Bruni] does a fantastic job as a tactician in these very tricky conditions. He is like a wizard out there, and gets us out of trouble when it is needed." And this is only Bruni's second RC44 regatta with the team. While today's conditions were lighter and weren't quite as up and down as yesterday, there was a significant right shift that forced the race committee to up anchor and move the course prior to race four. "Hardest for us were the starts," admitted Bruni. "They were okay, but not brilliant and especially the last one." In this they received a penalty, but impressively fought back to finish second – Bruni said he was most proud of this race. As to why they are doing well here, Bruni thinks it is because of the training they managed to put in with Törnqvist prior to the event. 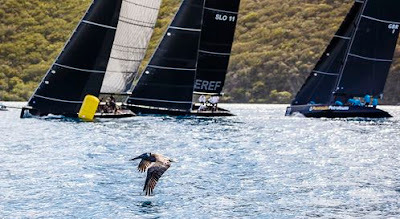 The final two races of the day were won by Vladimir Liubomirov's Bronenosec Sailing Team and John Bassadone's Peninsula Petroleum respectively. 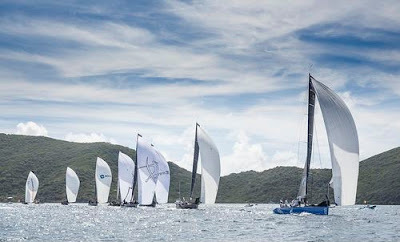 Bronenosec Sailing Team survived best in race three when a small squall passed through North Sound. "Another nice day, another one won and we improved, so it is very good," said Liubomirov. "Me and my team are happy. The wind is nice and I like how shifty it is, because it is not easy for the tactician or for me." With his team now second, while Vladimir Prosikhin's Team Nika has dropped to fourth, Bronenosec is currently favourite to win the overall RC44 Fleet Racing championship. "There are at least five teams fighting for the podium and overall it is still not clear who will be there and in which position," observed Prosikhin. John Bassadone's Peninsula Petroleum finally came good in the last race, while a solid 2-2-1 in the final three races elevated the Gibraltar-based team to third overall. On their win, Bassadone said it came "with great difficulty! It's been a pretty complicated couple of days, very hard. We just kept on working hard. We are happy to be back at this end of the table." As to why, Bassadone continued: "I think it's a bit of everything - a decent start, the boat speed is definitely something the guys have worked very hard on since the last regatta, good tactics, good crew work and also a little bit of luck - or no bad luck." 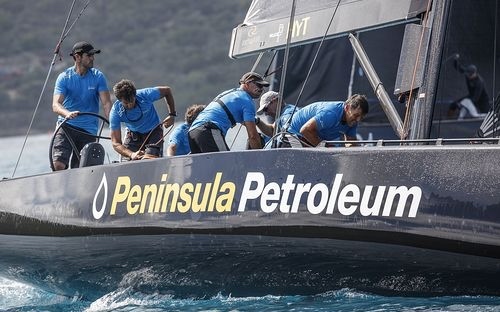 Peninsula Petroleum's bubbly Italian tactician Vasco Vascotto, like Francesco Bruni, is also another who seems able to make sense of ultra-shifty conditions, vital for the last race with the wind blowing over the top of Virgin Gorda. 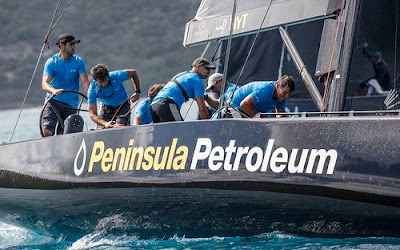 In fact Peninsula Petroleum managed to pick up their own personal puff coming into the first top mark rounding which helped them round ahead. "We like to sail inside the bay - it's different, so it is a matter of playing a little more the shifts, something we like," said Vascotto. "More than the result, we are happy we are sailing better in terms of our speed and crew work." "Moding is very important - you need to sail the boat a little differently than normal sailing conditions. If you have some shifts, sometimes you have to go faster, other times you have to go a little slower and be patient. That is something we are improving during these days." The penultimate day of fleet racing takes place tomorrow and once again we wait to hear whether it will take place within the confines of North Sound or outside in more open water.